Oh, don't worry. After the self-imposed death by bile injection of the Tea Party and after the putrid lingering death rattle from the five necrophilous toadies that make up the majority of SCOTUS, the media will resurrect once more the death worshippers to carry on the eternal political struggle to benefit the makers of of low-T treatments, hemorrhoid interventions, and the University of Phoenix. Until such time, we can only marvel and gasp at the pace that intellectual integrity now degenerates into openly-fascist froth. The 1965 Voting Rights Act, which gave African-Americans in the deep South access to the ballot box, is a “racial entitlement,” U.S. Supreme Court Justice Antonin Scalia said Wednesday as the court heard oral arguments in a legal challenge to the landmark law from the state of Alabama. U.S. Supreme Court Justice Antonin "Nino" Scalia describes Voting Rights Act as a "racial entitlement"
“I don’t think there is anything to be gained by any senator to vote against continuation of this act,” Scalia said. “They are going to lose votes if they do not re-enact the Voting Rights Act. Even the name of it is wonderful — the Voting Rights Act. Who is going to vote against that in the future? I am fairly confident it will be re-enacted in perpetuity. The case of Shelby County vs. Holder is a challenge to the landmark Section 5 of the act. It requires nine states (eight in the South) as well as local governments in other states to “pre-clear” changes in voting procedures with the U.S. Department of Justice. The act has been invoked as recently as the 2012 election, in which several state legislatures made rules changes designed to impede early voting. Despite a proposed 170 central office employee layoffs, five school closings, changes in the teacher-pupil ratios in the schools, a reduction in the district’s contribution to employee health insurance premiums and other cost-cutting measures, however, a preliminary 2014 general fund budget for the unified district was still short by $83 million. Meanwhile, no one at the School Board is talking about the primary reason there is a projected deficit of $200 million. If the local news media were interested in finding out, it on page 168 of the Transition Commission's Report from 2012. This is what happens when 20 percent of the the system's students are turned over to corporate apartheid charter schools to be psychologically brutalized in the name of equal education. A system with multiple school operators (e.g. District, ASD and charter schools) inherently costs more to operate due to loss of scale with fixed costs being allocated across a smaller volume of students. This multi-operator environment is in place today and is projected to expand irrespective of the merger. To date, the districts have found creative ways to manage the increased costs of the existing multi-operator system (e.g. cutting or shifting 400+ positions out of the General Fund to right-size staff). However, with the projected share of students in non-district operated schools expanding rapidly in the next few years—from approximately 4% in FY2012 to 19% by FY2016 (equivalent to approximately $212M of revenues shifted to charter schools and the ASD in FY2016)—it is critical to implement strategic cost management to ensure each pathway in the Multiple Achievement Paths model is financially equitable to students. What is the sound of one test taken? Now, apart from intensive national propaganda, quite apart from German national propaganda, the 'university system' of Germany is evil. It is evil wherever in penetrates. Its 'universal pervasiveness' is a poisonous and most pestilent sort of pervasiveness. The drug is insidious and attractive. It is evil because it holds up an ideal of 'scholarship', not an ideal of humanity. It says in effect: you are to acquire knowledge in order that knowledge may be acquired. Metaphorically, you are to build up a dam'd and useless pyramid which will be no use to you or to anyone else, but which will serve as a 'monument'. 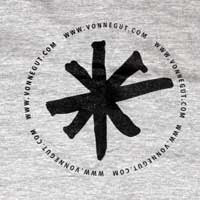 To this end you are to sacrifice your mind and vitality. The system has fought tooth and nail against the humanist belief that a man acquires knowledge in order that he may be a more complete man, a finer individual, a fuller, more able, more interesting companion for other men. The student has become accustomed first to receiving his main ideas without question; then to being indifferent to them. In this state he has accepted the Deutschland über Alles idea, in this state he has accepted the idea that he is an ant, not a human being. He has become impotent, and quite pliable. This state of things has gone on long enough already. The bulk of scholarship has gone under completely; the fascinations of technical and mechanical education have been extremely seductive (I mean definitely the study of machines, the association with engines of all sorts, the inebriety of mechanical efficiency, in all the excitement of its very rapid evolution). America has yet no notion of reforming her universities....Provincialism I have defined as an ignorance of the nature and custom of foreign peoples, a desire to coerce others, a desire for uniformity--uniformity always based on the temperament of the particular provincial desiring it. The uncritical habit of mind spreads from the university to the Press and to the people. I am well aware that this uncritical habit of mind is hidden by an apparatus criticus, and by more kinds of 'criticism' and criteria, and talk about criticism than the man in the street has heard of. But it is for all that uncritical. It divides facts into the known and the unknown, the arranged and the unarranged. 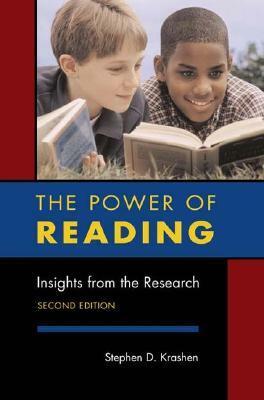 It talks about the advancement of learning and demands 'original research', i.e., a retabulation of data, and a retabulation of tables already tabulated. What is the greatest recent victory in the backlash against standardized testing that has terrified “reformers” as it has reached a "crescendo?" A) The Garfield High School teachers’ boycott of the administration of standardized tests. B) The 120 Massachusetts professors’ protest against standardized testing. C) The Chicago, Georgia, and New York protests that inspired the Massachusetts stand. D) The 818 Texas school districts that have joined the protest against bubble-in excesses and the thousands who joined the Save Texas Schools rally in Austin? I am too biased to answer such a question. For decades, top Oklahoma teachers and students fled to the better schools in Texas. 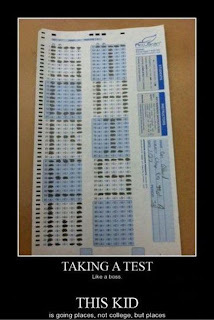 However, many became trapped in the Texas testing mania and returned with horror stories. But, recently, Oklahoma has been forced to adopt much of the worst of the Texas system, even though we do not have nearly as much money to mitigate the damage. And, two years ago the Texas legislature cut public schools by $5.4 billion, even as they are sending $1.2 billion to the Pearson testing company. This means that Texas also faces the worst of both worlds. So, I will simply try to draft some multiple choice questions regarding the Texas rally. A) Funding Pearson and testing at such a time is not like the tail wagging the dog, but as former Education Commissioner Robert Scott said, “the flea at the end of the tail of the dog trying to wag the dog." B) Senator Kirk Watson’s explanation that “the Legislature is sitting around like a litigious deadbeat dad waiting from a ruling from a higher court." C) Superintendent John Kuhn's affirmation that the 2011 cutbacks and continued testing were "our Alamo," but "this year is our San Jacinto." D) Robert Scott’s explanation of why he had to reject test-driven reform, "I had to turn in my reformer card because I looked at it as a flea circus," he said. "They are selling two ideas and two ideas only: No. 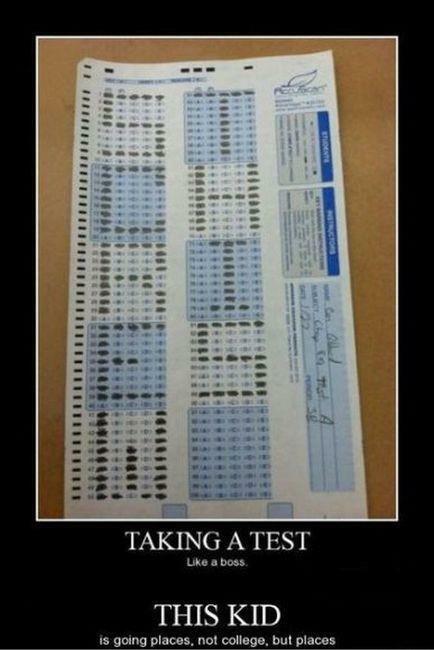 1, your schools are failing, and No. 2, if you give us billions of dollars, we can convince you [of] the first thing we just told you. A) Joe Arnold, Chair of the Workforce Committee for the Texas Manufacturing Association, observed that if testing was working so well, why would Texas need to recruit outside talent for 21st century jobs? B) Explanations by former State Comptroller Carol Keegan Strayhorn and others about colleges not wanting high school graduates to only be trained to take tests and write according to the test's formula. C) Superintendent Mary Whittaker’s observation that it is shameful for schools to put up banners and pass out stars to exhort students to try harder on tests as schools cut the arts. D) John Kuhn said, "Some people have forgotten that good teachers actually exist. They spend so much time and effort weeding out the bad ones that they’ve forgotten to take care of the good ones. This bitter accountability pesticide is over-spraying the weeds and wilting the entire garden." A) Affirmations that teachers may have been slow to anger, but that they are tired of the narrowing of the curriculum and the pushing out of students who might lower test scores, and now that they are joined by parents and administrators, a change is bound to come. B) The articulate and professional quality of student speakers who described the pain of their teachers in narrowing the curriculum and pushing students out, their critiques of vouchers and other ill-conceived market-driven reforms, and the demonstration of the excellence that our kids produce when treated with respect. C) Seventeen year-old Luz Zamora's thoughts on testing and her moving rendition of "Amazing Grace." followed by the students from Kashmere H.S leading the closing performance of the "Harlem Shake." D) The way that these students gathered around Diane Ravitch at the end of the rally and the inspiring exchange of wisdom across the generations. Leaders of the area Public Building Authority are accusing the Knox County Schools chief and school board members of misleading the public about the state of security systems in at least two schools and putting taxpayers at financial risk. School officials Saturday, however, disputed PBA members’ assertions. At a meeting Tuesday, PBA’s board of directors asked attorney Morris Kizer to draft a statement notifying Knox County Commission, Mayor Tim Burchett and the public that the school system’s statements about the state of security systems at the two schools were at best misleading and at worst untrue. The move comes amid growing concerns over school security systems that began when PBA discovered all manner of woes with systems installed at Hardin Valley Academy and Powell Middle School. PBA’s 2008 discovery led to an independent audit in 2011 that revealed unsafe wiring, codes violations, fire wall intrusions, missing motion detectors and non-working cameras, among other things. PBA sued the firm responsible, Professional Security Consultants & Design. McIntyre has repeatedly said the school system’s new security monitoring firm had “identified deficiencies” in all schools and made repairs. However, the Knox County Law Department last week confirmed to the PBA that no repairs have been made at Hardin Valley or Powell Middle aside from fire wall intrusions that PBA ordered fixed in 2008. The conversation that can change the course of history is well underway. It's time for our political leaders to listen. When opting a child out of a standardized test is considered civil disobedience, something is very wrong and very sick about that society. Barbara Madeloni at The Chalkface Radio tells it like it is. The cost of freedom and truth about corporate ed deform is getting higher along with the cost of everything else. But, it's more dangerous not to talk. In the spring of 2012, I participated in Occupy the D.O.E, and had a similar experience. Rich conversations, good people, shared worries, anger and hope. I left there feeling more alive and connected to humanity. I left with courage to use my voice and humility to listen well. Education is a conversation and knowledge emerges in conversation. Education is experiencing and preparing for the kinds of interactions the Occupy movement offered. Freire talks about the indispensible qualities of a progressive teacher as including humility, trust, patience and impatience…These are the qualities as well of human beings in community, making meaning, creating possibilities. 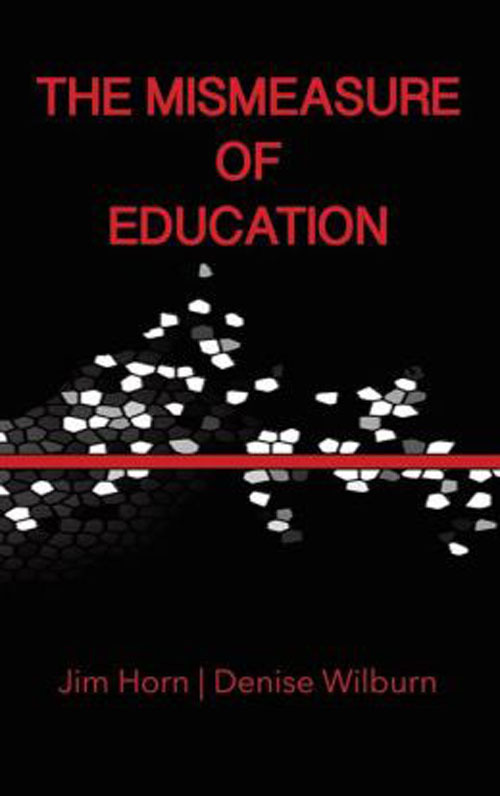 If education is a conversation, if knowledge is something we create as communities and that emerges in how we make our world, then the assessment lies in the conversation, in the actions, in the shared meanings, conflicts and continued questioning. If education is a conversation then our demands are for public spaces to have those conversations, for time, for resources, for people to be able to enter the conversation from a space of physical, emotional and psychic security. If education is a conversation teachers must be prepared to be reflective, attentive to their own and others positions, to listen well, to engage the complexity of human relationships. Freire talks a lot about trust. I think about what it means to enter a dialogue, a conversation, with trust; trusting students, teachers, parents, community members. Trusting ourselves to listen and learn, to know and to not know, to ask questions like: what is the purpose of education? what is the nature of knowledge? The accountability regime is based on mistrust. Mistrust of teachers, students, teacher educators, parents, the people. From the media and establishment there were calls for Occupy Wall Street to state its demands. Similarly, corporate deformers and their operatives want education activists to state alternatives. They want to know how we are going to assess without tests, what curriculum we will use if not the common core, how we will be accountable. I believe we must refuse their questions and demands for a clear and singular message. They use these to trap us in their narrative. I refuse their narratives and their questions. We need to ask our own questions. We need to tell our own story. Here are some of my questions: Why is income inequality increasing? Why are our prisons overflowing? Why are some of our children, black and brown and poor children, being subject to dehumanizing schools and endless testing? Why are teachers ridiculed and unions being busted? Why are corporations taking over the work of teaching and teaching teachers? Why are people fearful of speaking out? Who is doing the silencing? To what end? Here is my narrative: I want education for democracy and justice. I want education for liberation. I want conversations about what we all want for and from education. And I want the movement against the corporatization of education to itself be democratic and liberating, to be a conversation in which we ask questions, listen, trust, name structures of power and oppression, imagine new possibilities, and act, and then converse some more. In Zuccotti Park in the fall of 2011 all kinds of citizens gathered, talked, listened, named their world, and began to take action based on what they saw. This happened as well in Oakland, in Nashville, in Boston, in cities and towns across the country. In the fall of 2011, we began to enact a true public education. And we were shut down. We were violently suppressed. I saw a young man dragged from the sidewalk into the street in order to be ‘legally’ arrested. I was with hundreds of people when the police locked us in Zuccotti Park, their intention clear: incite panic and then be able to react with violence. I watched vans empty and police in riot gear march in lock step down 43rd Street, batons drawn. And I did not even see the final brutality of destroying the Occupy Wall Street encampment. Violence and brutality because people came together to talk, to name and to act. Even though there was not a single clear demand, they shut us down. Even though we did not speak with one voice, they shut us down. Even though we were not specific in the alternatives we offered, they shut us down. They shut us down because we were talking to each other, because we were taking our space and our time, because we were naming the world in terms other than those they gave us. Because we were engaged in conversations, in education. Looking forward to April and Occupy the D.O.E. 2.0—to talk, to act. The common core requires that all students be connected to the internet in order to take the tests that enforce the standards. This represents an investment of billions. New York City and the State of Florida have budgeted about a half a billion each just to set up internet connections for all students, and you can be sure that as soon as the infrastructure is in place, it will be declared obsolete, resulting in a never-ending flow of taxpayer money to computer and testing companies. The Post reported that most of the cuts will affect programs for poor children and students with disabilities. The feds are decreasing funding for teaching and learning but continue to demand that districts and states fund testing, investing in weighing the animal rather than feeding it. New York funding: New York Times, "In city schools, tech spending to rise despite cuts," March 30, 2011. Disclaimer: The publishers of this document, Truth in American Education, have some very disconcerting right-wing membership and advisors. I mean really right wing, like Heritage, Koret, the Teabaggers, and other assorted birthers and Birchers. However, this Common Core State Standards Primer document appears on the Hoosiers Against Common Core site that Professor Ravitch mentions in her recent Two Determined Moms in Indiana Take On Common Core post. Like the old adage: "even a broken clock is right twice a day," this flyer provides factual information on the Corporate, er... I mean Common Core State Standards. While I have major ideological differences with their organization, I find their assessment of CCSS to be pretty much spot on. When it comes to the corporate-religious-political bullying for the Amway/Walmart/ALEC/Overstock.com/Koch Brothers assault on Indiana school children, the Republicans will stop short of nothing. House Bill 1342 was a perfect example. Having moved out of committee but finally killed off yesterday by GOP House Speaker Brian Bosma, this bill sought to strip Indiana superintendent of public instruction Glenda Ritz and the Department of Education of all power to monitor the state voucher schools, giving instead, the Koch-Brothers/ALEC crony Chris Atkins and his Indiana Office of Management and Budget complete control over voucher school funding distribution, oversight, and even voucher school visits. With OMB’s State Board of Accounts now handing charter school audits over to private companies, House Bill 1342 was meant to punish Ritz, who was originally involved in the lawsuit to stop Indiana’s school voucher system, and lead to even more lack of oversight. Mike Pence recently rehired Chris Atkins to lead OMB. A past tax and fiscal policy director at ALEC, the Anderson, Indiana-born Atkins began working for the sociopathic voucher lobbying and propaganda mill, the Milton & Rose Friedman Foundation for Educational Choice, after leaving as OMB policy director where he hammered out the Mitch Daniels’ anti-public school property tax plan, one of the first initiatives to drain funding from the schools. Not surprisingly, Atkins is a member of the pro-school voucher Institute of Justice’s Human Action Network, a group of IJ student law conference alumni who volunteer for various cases IJ deems appropriate. IJ is battling in court to save the Indiana school voucher program. Atkins, however, is not the only OMB employee with ties to school voucher groups. The Friedman Foundation-funded and Tea Party Americans for Prosperity is represented at OMB’s Department of Government Efficiency and Financial Planning by Gloria Downham, whose husband, Chase, heads the Americans for Prosperity’s Indiana branch. Chase, a former Mike Pence intern, helped elect Republicans for the Indiana Chamber of Commerce. Chase and Gloria are parishioners at the St. Monica Catholic Church which operates its own Indianapolis school receiving state vouchers. Former Ice Miller attorney Brian Bailey, OMB’s chief of staff & general counsel, is also a Tax Foundation crony. Micah Vincent, at OMB’s Department of Local Government Finance, likes to attend Friedman Foundation events, too. If you want more on Indiana school voucher schemes, like visits to the Creation Museum, see Zack Kopplin’s report here. In other words, it was an act of bullying and pure politics, plain and simple, one geared on “moving” Indiana back into another century, with a Good News Club in every public school still left standing. If one believes that OMB would have been capable or willing to regulate Hoosier schools receiving vouchers in any way, shape, or form, one would have to believe that humans walked hand in hand with the dinosaurs and that Jesus hated the poor, which many in the school voucher movement either believe or like to lie about. It is hard to understand why teachers’ satisfaction has dropped to an all-time low during the Obama Administration. Yes, Secretary of Education Arne Duncan has doubled-down on the bubble-in madness of NCLB. Duncan has pushed the agenda of the “Billionaires Boys Club” which threatens to kill the principle of public education. The administration has dumped “innovation” after “innovation” risky gamble after risky gamble on teachers, and set us up as scapegoats when they fail. Seriously, even the Obama administration, and perhaps even Bill Gates, must have some inkling of how their experiments have wrecked the morale of teachers. When they propose a new medical cure, surely they don’t think that it will make the lab rats happier. Resmovitz also notes that President Obama “proposed a new teacher satisfaction initiative in his 2012 State of the Union address, but failed to deliver on it.” Follow the link to the President’s election year promises and it is easy to understand why his policies are driving the joy out of teaching. He asked for our votes by promising RESPECT. RESPECT, to him, meant more merit pay, more “accountability,” fewer due process rights, and “innovations” driven by bubble-in testing. The President’s initiative was a grab bag of mutually contradictory missions. The administration coerced states and districts into firing teachers using standardized tests, while promising to liberate us from teaching to the test!?!? His Secretary of Education praised teacher autonomy, as he gave us the “burden for securing our economic future.” If Secretary Duncan respected teachers’ autonomy, would he have imposed mandates that most educators and social scientists believe are destined to fail?. And, as Resmovitz stresses, we ain’t seen nothing yet. After years of being forced to teach to primitive high-stakes basic skills tests, now we must turn on a dime and teach to the completely different Common Core assessments high-stakes gamble. I wonder what the Obama Administration would think if the table was turned. What if teachers union presidents had issued our State of the Schools election eve address? What if we held President Obama (who seems allergic to using the word “poverty”) accountable for ending generational poverty and violence so that we could teach for mastery with all children? What if we’d given candidate Obama the choice – it is “the Billionaires Boys Club” money or our votes? Of course, teachers do not have the power to make such an ultimatum. 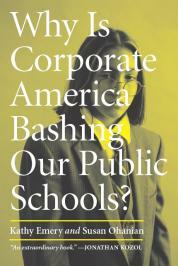 We’ll be doing well if the corporate powers that Obama needs do not privatize our schools. Perhaps we have gone full circle. Are the job satisfaction levels of Democratic presidents dropping as they are forced, more and more, to do the bidding of the billionaires? Should we not expect everyone’s job satisfaction to drop as America becomes more and more like an oligarchy? Question: Define the purpose of guttering on a house. Answer: Choose the response that represents your thinking. We have a gutter on our house that is a bit askew in one place over the porch and near the front steps. Consequently the rain will come off the room slip by the gutter in that spot and pour straight down. This has clearly been the case over the years prior to our occupation as the front walk has begun to sink a bit and now pools water right in front of the porch. My "fix" has been to insert a stick underneath the roof lip to adjust the drip line to meet the guttering in the right place as the guttering itself will not adjust properly. This works, but the pooling persists, naturally, due to the current sloping state of the ground. I moved this stick the other day as my son and I were headed out for school (a ten-minute walk), a minor adjustment made by a shrewd handyman. As we crossed the road my son asked me about this. Why? You tell me. I don't know. Guess. You were doing something to the gutter. Yes. What? I don't know. What is a gutter, that is, what is its purpose on the house? To collect the rain. Why? I don't know. Where does the rain go without the gutter on the house? Straight off the roof and into the ground. What's wrong with that? I don't know. Are houses built so that their "bottom" sits right on the ground? I don't know. Is ours? No. What is it built on. A wall? Yes. Why? I don't know. Why are there gutters? C'mon, Dad! Why can't you just tell me? Why won't I just tell you? Ugh. What is the Bill of Rights? What? What is the Constitution? What is the sunrise? What is "an apple a day"? What is the Bible, the Quran, the Vedas, the Analects? Dad, what are you talking about? What the heck are Vedas? Foundations. What formed the Grand Canyon? A river. How? Um... What is a river? Dad!!! What happens when it rains on city streets? What do you mean? When the rain falls on our yard where does the water go? In the ground. Can it go in the ground when it hits our roof? No. Can it go in the ground when it hits our streets? No. Where does the water go that falls on the streets? The sewer? Yes, through those storm drains. 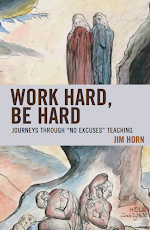 There's a lot going on underground to make what is above ground work and persist. What happens if there are no storm drains and no sewers? I don't know...road rivers. And? I don't know. What formed the Grand Canyon? Hmmm. What happens to a sand castle when the tide rises over it? What's that got to do with it? Well? I guess it ruins it. Right. Water makes stuff happen whether as falling drizzle, rising tide or rushing torrent. Why do we want to keep the water away from the wall? Why are their gutters? Because there are houses. Without houses there are no gutters. Without streets, without houses, without gutters, without sewers...Just rain on the ground. Hey, what about a rain barrel? Yes, what about a rain barrel? It doesn't just take away water. Good. Question: What is a cistern? d. a functional representation of a way of thinking. A major goal of PE is to introduce students to a variety of sports. In this spirit, it is exciting that archery has become so popular. According to “Archery coming to Frontier Middle School in Wentzville” (Feb 19), one of the motivations for including archery in school is The Hunger Games. But the message of The Hunger Games was not to get good at shooting arrows. The message was the Capitol’s efforts to divert the districts’ attention from the source of their problems, the Capitol’s oppression, and to devote their energies to competing against each other in a cruel game of death. Haymitch recognized this when he advised Katniss to “ …. remember who the enemy is” as she entered the arena for the second time. The other priority item for Eli Broad's Supt. McIntyre is "technology," which means building the capacity for online high-stakes national tests that will be part of the national standards known as the Common Core. Are Knoxville parents supportive of public schools? Yes. Do they want to waste money for the benefit of profiteers and schemers who are draining money from public schools? No. Do they believe in good research and frown on attempts at manipulation. You bet. In 2012 the county’s public schools asked for $35 million more in the county’s annual budget, but received a $7 million increase in funding, and it appears that there may be a similar request in the 2013-14 budget proposal. “Last year there was a huge demand by the school system for its budget and we wanted to ask what do people really feel about public education,” said Jennifer Evans, vice president of public policy at the Knoxville Chamber, which has a history of endorsing higher public spending on schools. The survey showed that 80 percent of respondents believe that students should have electronic access to course material, the same level of support for increased teacher pay. “If that requires additional funding, can that be covered by property tax or some other ways?” Evans said. The survey results also showed that nearly half of those polled believe academic standards are too low, but two-thirds agree that their neighborhood school is effective. Randy Boyd, founder and president of Radio Systems of Knoxville, funded the survey with five other individuals to have data to back the sentiments of Knox County voters regarding education. “I hope that everybody involved in the decision going forward might have better information to make those decisions,” Boyd said. Boyd is a known supporter of education. He’s an adviser on higher education to Gov. Bill Haslam and in 2012 he was part of a group that gave $42,000 to the Chamber for advertisements supporting an $35 million for Knox County schools. The survey represents a different tack: to provide hard figures on public sentiments about schools through the years. The data will be updated annually and questions may be added, he said. Boyd agreed that those most zealous voices on an issue can often drown out sentiments from the bulk of a population.. . . . The zealous voices are back, Mr. Boyd--and there are more of them and they are louder than ever. Too good to miss from our national treasure and every corporate education deformer's nightmare. At Daily Uncensored. Since Wall Street's grand theft of 40 percent of the nation's wealth in 2008, the federal government has passed out billions in grants to states and cities for various projects, many of them even worthy of our tax dollars. This process provided many great opportunities to incentivize policies that could alter what has become the intensification of housing and school segregation over the past 35 years. And yet there were no incentives offered, particularly in the guidance or bonus points or stipulations in Race to the Top. Instead, incentives were provided for more intensely segregated charter schools run by corporations. This madness doesn't have to continue this way. We could do something different if the plutocrats' corporate drones could be run out of Washington.
. . . .Our contemporary income segregation becomes even more intense when we drill down from the metro to neighborhood level. Sociologists Sean Reardon and Kendra Bischoff have been doing this drilling, using Census tract data. Back in 1970, the pair have found, 65 percent of America’s families lived in “middle-income” situations, neighborhoods where incomes range from 80 to 125 percent of the median, or most typical, income of the larger metro area. By 2008, only 43 percent of U.S. families lived in middle-income neighborhoods. Meanwhile, over that same span, the share of families living in either poor or rich neighborhoods essentially doubled. In 2008, note Reardon and Bischoff, nearly one in three U.S. families in metro areas “lived in neighborhoods at the extremes of the local income spectrum,” in poor neighborhoods with incomes under 67 percent of the metro median or in affluent neighborhoods with incomes above 150 percent of that median. Today’s affluent, Reardon and Bischoff observe, actually live more segregated lives than America’s poor. These affluent have become “much less likely” to live in mixed-income neighborhoods than poor families. Average Americans, for their part, are paying a heavy price for this growing segregation. The more isolated the rich become, the more they withdraw into their own private worlds and the less interest they have in supporting public services that can benefit the wider community. Growing inequality and income segregation impact us on a deeper level as well. The more unequal we become, notes University of Maryland political scientist Eric Uslaner, the less we feel we have “much in common” with people not like us. Between 1968 and 2006, Uslaner’s research documents, the share of Americans who believe that “most people can be trusted” dropped from 56 to 34 percent. “Such overarching pessimism,” he observes, shreds social cohesion and invites political polarization. Finding “common ground” becomes ever more difficult. Into this doom and gloom, Stanford historian Richard White has just brought some egalitarian sunshine. Once upon a time, White writes in a fascinating new Boston Reviewessay, most Americans lived in much more equal circumstances. In other words, nothing in the American “character” hardwires us to chase mindlessly after grand fortune — or accept income segregation. Readers have probably already seen the news of how the morning after I trounced the incumbent at a local candidate forum, that NYC Mayor Bloomberg increased my opponent's already obscene campaign fund by a whopping $1 Million. We had begun our campaign early, because we knew that the corporate reformers would "up the ante" this election cycle, but I don't think anyone anticipated the right-wing Coalition for School Reform (CSR) would raise over $2.5 Million in support of the corporate candidates for the March 5, 2013 election. This is significantly more than they raised last election cycle. Robert Skeels is a pro-public school candidate in Los Angeles. He has raised $15,000. He will not get anything from Eli Broad or Michael Bloomberg. The LA Times asked me for a quote on Bloomberg's $1 Million CSR donation. Here's my response: "As a community candidate who has raised over $15,000 through myriad small contributions from local parents, community members, and classroom teachers, I find it dismaying that a single out-of-state billionaire has a greater voice in our school board election than all the working families of District 2. Where were these millions of dollars when the incumbent callously cut early childhood education, adult education, and K-12 arts last year?" I'm not expecting to out-fund-raise the billionaire boys club, but every donation counts. If you believe in public education, and have followed my work on schoolsmatter.info and other sites, then you know what I stand for. If you're in Los Angeles, we can use your physical help with precinct walking, phone banking, and letters to the editor. If you aren't in town, consider a donation. We're a few weeks out, and the last minute help can make all the difference. Award-winning documentary film-maker Chris Hume captured footage and interviews from the Robert D. Skeels for LAUSD School Board campaign's third weekend of precinct walking on January 19, 2013. Filmed on 1st Street in Boyle Heights at Purgatory Pizza just prior to the group going out to talk to voters. Featured in the video are two widely respected educators whose support is greatly appreciated. Robert D. Skeels' longstanding as a principled community activist has won him broad support with families, community leaders, and grassroots organizations. LA Schools Report recently wrote about him: "just one School Board candidate [is] running a truly grassroots campaign built on dozens of volunteers and more than a hundred small contributions of as little as $5 — and little else by way of outside support." Robert's record of defending schools like Garfield HS from outside takeover, siding with public school parents against colocations, advocating for the rights of special needs students, and standing up against the incumbent's cuts to early childhood education, elementary arts, and adult education has demonstrated that he will aways fight for the community and stand up against corporate interests. 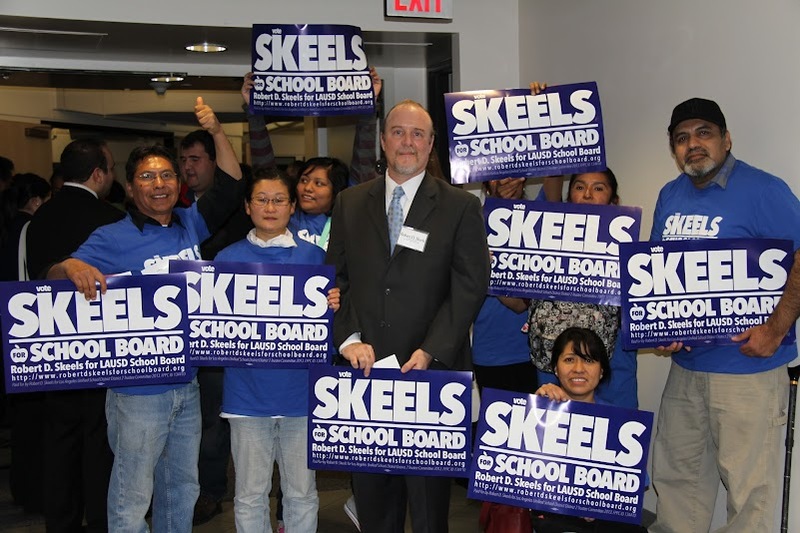 Because of his extensive education policy knowledge and deep understanding of local issues, Robert D. Skeels is the only District 2 candidate endorsed by both United Teachers Los Angeles (UTLA) and Associated Administrators of Los Angeles (AALA). Robert is also endorsed the former U.S. Assistant Secretary of Education, Dr. Diane Ravitch, and many other national and local education experts including: Professor Stephen Krashen, Professor Paul L. Thomas, Professor James Horn, Dr. Rosemary L. Lee, Dr. John Thompson, Dr. John Fernandez, Susan Ohanian, and Cheryl Ortega. A regular contributor to education websites like the nationally recognized schoolsmatter.info, Robert is an advocate of what works in education, not expensive fads or wasteful experiments. He supports proven, research based methods of pedagogy, including dual language immersion programs, project based learning, free voluntary reading with ample access to libraries, and critical studies. The current LAUSD leadership has a long history of squandering our community's money as evidenced by massive spending on useless assessments, expensive consultants, highly discredited value added methodologies, and nine figure real estate giveaways to lucrative charter corporations. Instead of looking to cut the former expenses, LAUSD leaders have targeted programs that our communities depend upon most — Early Education, Student Readiness and Language Development Program (SRLDP), Elementary Arts, and Adult Education. The Superintendent and LAUSD Board of Education President have continually balanced the budget on the backs of the working people. Robert D. Skeels has been on the forefront of every struggle to fight budget cuts and to save programs critical to our community. Public education activist, researcher, and writer Robert D. Skeels has lived, worked, and organized in District 2 for over 18 years. He and his wife, Yoon Jung Lee, make their home in Historic Filipinotown. Robert is a U.S. Navy Veteran. He attended Glendale Community College and the University of California at Los Angeles (UCLA). Robert taught Catechism at St. Teresa of Avila Church for 12 years. For the past 15 years he has volunteered ten hours a week teaching life and literacy skills at the Mary Lind Foundation. Robert is a committed member of a number of grassroots education and immigrant rights organizations including Coalition for Educational Justice, Public Education and Social Justice Advocacy, The Trinational Coalition To Defend Public Education, The Southern California Immigration Coalition, and Veterans for Peace. Robert's articles and essays have appeared in publications including: Schools Matter, CounterPunch, Dissident Voice, Daily Censored, Echo Park Patch, and The Los Angeles Daily News. “House of Cards” was released just as “Won’t Back Down,” the movie about a mother and a teacher who team up to save the moppets in a gulag-like inner city school, mercifully disappeared from the local multiplex. The film’s promoters cagily created the impression that its breathless action was inspired a real-life turn of events in which parents take over the hellhole and turn it around. The real-life turn of events never happened, not even close. There are, however any number of politicos and groups that would like to see the passage of “parent-trigger” laws. One of the policy’s advocates bankrolled the film, in fact. I’m sure it’s available on Netflix. Stream at your own risk. Will Chicago Public Schools Be Sued Duing Black History Month for Its White Curriculum? CHATHAM — State Rep. Mary Flowers (D-Chicago) is urging a community group to file a lawsuit against Chicago Public Schools for not complying with a 22-year-old state law that requires all public elementary and high schools to include black history as part of its regular curriculum. "I encourage you to file a lawsuit against CPS to make them comply with the state law," Flowers said at a Saturday meeting with community group We Can Inc. at Josephine's Cooking restaurant, 436 E. 79th St. . . . In 1986, Flowers sponsored a state law, which took effect in 1991, mandating public schools make black history a part of their regular curriculum and not just taught during Black History Month in February. "The proposed curriculum CPS has presented is unacceptable," said Florence Cox, president of We Can Inc. and the first black president of the Chicago Board of Education. "It lacks our history and language arts. There is nothing in here about who [African Americans] are and where we came from." Barbara Byrd-Bennett, chief executive officer for CPS, did not attend the meeting, but was represented by Phillip Hampton, chief community and family officer for CPS. "Barbara needs to meet with you. I do know she is aware of this situation," Hampton told the community group. "I will speak with her on Monday and elevate this issue to her, so that by Tuesday you have a response back. " State Rep. Monique Davis (D-Chicago) attended the last meeting held on Jan. 27. At that meeting she said too many black kids are attending schools named after blacks, and the students don't even realize it. "Most of the students who attend Paul Robeson High School [on the South Side] don't know anything about him other than he is a black man," said Davis. "And that's a shame." According to CPS data, 99 percent of the students at Paul Robeson are black, and at William Harper High School, also on the South Side, 93 percent of the students are black. John Thuet, 28, teaches world studies to freshmen at Harper High School and has worked at the school the last four years, but he doesn't know who William Harper is. "You know, that's a good question. I don't know who William Harper is, but now that you've asked I plan on looking him up to see," Thuet, who also chairs the school's history department, said. Examples like this, said Hampton, are not good, but fall within the leadership of the school. "We have a lot of challenges with teachers. When I was a business teacher at DuSable High School, I made sure my students knew who [Jean Baptiste Point] DuSable was, even though I was not a history teacher," said Hampton. Possible school closings also were discussed at the meeting. Many of the 129 elementary schools CPS is considering closing in June are located in black neighborhoods on the South and West Side, said Flowers. While Hampton acknowledged that the recently released list contains "many schools on the South and West Sides," he denied Flowers' allegations that those areas were targeted by design. "None of these schools being considered for closure are overcrowded," Hampton said. "As for the empty school buildings, once the closure process is complete, the buildings would probably be sold." The method CPS is using to determine which schools to close is a broken formula, added Flowers. "School closings are done purposely to drive [black] kids out of certain areas experiencing gentrification," said Flowers. "The closings of these schools are criminal."